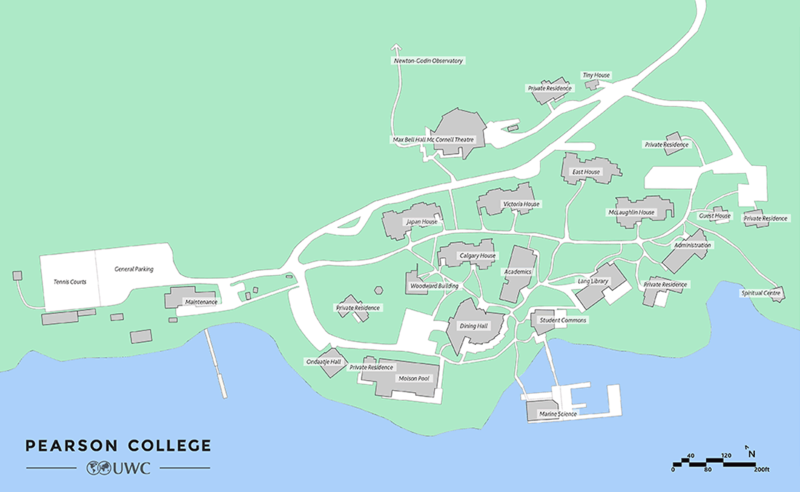 Pearson College UWC is located along the forested shores of the Pacific Ocean at sheltered Pedder Bay, on the southernmost tip of Vancouver Island in the Province of British Columbia, Canada. Our beautiful campus is 29 km southwest of Victoria, the provincial capital. We are proud to acknowledge that we live and learn on the unceded territory of the Scia’new (Beecher Bay) First Nation. Thinking about popping in for a visit? We’d love to see you, but as this is an active campus, we ask that you abide by some general guidelines. Call 250.391.2411 with any questions, or email visit@pearsoncollege.ca. Visitors are most welcome but to avoid disrupting classes and other activities, we advise that students who left in the previous year, friends and siblings of current students are allowed to stay overnight only on Fridays or Saturdays, subject to the availability of rooms in the Max Bell Hall. We do not encourage parents to stay on campus unless in exceptional circumstances. Visiting parents are asked to find off-campus accommodation. Contact admin@pearsoncollege.ca for a list of recommended accommodations. Permission to visit or stay overnight must be obtained in advance from the Dean of Students. During the first two months of the school year, when first and second year students are getting to know each other, and during the examination period stretching from the second half of April (when more intense preparations begin) to the end of term, we generally ask that students do not invite guests to the College, or host them. Check in at the Administration building reception desk to update your contact information and to pay your room and board fee. Please make sure you are aware of College rules, some of which may have changed since you were a student. Staff can advise you about changes on campus since you left. Join students, faculty and staff for meals in the cafeteria if you visit during academic terms. Meal tickets can be purchased from the receptionist in the Administration building. Note that that there is no smoking permitted anywhere on campus. Remember that people live on campus year-round; please respect their privacy and be sure not to enter the houses unless accompanied by a house resident.